Why are Abdominals Important? – Six Pack Abs Guide! You’re probably asking yourself, “Why are abdominals important?” I think it’s good that you raised that question. It’s important that you recognize the different parts of your abdominal muscles and their functions before kicking off your abs workout. That way, you avoid any untoward injuries that could render you incapable of performing abdominal muscle exercises. It will also prepare you for any other future fitness goals. We all know from the gecko that six pack abs are hot. But that only covers aesthetics. Have you ever wondered about the importance of well-conditioned abs in relation to overall physiological performance? The body is a very complicated piece of machinery, and every part of it is crucial. Muscle groups, including your abdominal muscles, are especially significant because they determine physical strength and resistance. That is mainly why abdominals are important – the stronger they are, the more efficient your body gets. You’re probably aware that the abdominals are situated between the ribs and pelvis. What you might NOT know is that your abdominal muscles are responsible for shielding your internal organs from external blows and giving your upper body a full-range of motion. Each of these sections is equally essential so you have to keep them strong and conditioned. 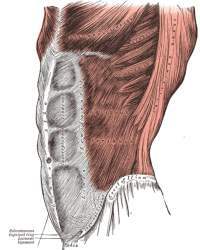 The Transversus Abdominus is the innermost layer of abdominal muscle responsible for stabilizing your torso and maintaining internal body pressure. You can just imagine how things can be if this part of your abdominals was weak. The Rectus Abdominus, which can be found in front of the pelvis and in between the ribs and pubic bone, is responsible for horizontal and vertical movements. It is also responsible for giving off the six pack indentation. So when you say “ripped” or “washboard,” you’re actually referring to the well-defined Rectus Abdominus. The External Obliques are located on each side of the abdomen. Now these muscles make it possible for you to twist from side to side. They also maintain abdominal pressure. The Internal Obliques, on the other hand, can also be found on each side of your abdomen, directly beneath the external obliques. Their main function is to provide support to your external obliques every time you lean over or twist around. Now that you know what the 4 main parts are, you can better develop and effectively carry out your abdominal training routine. Six pack abs are definitely more than just something nice to look at. Think about it – they were put there for a reason. Why are abdominals important and how can they keep you safe? Having a strong core means that you can easily prevent neck and back injuries. By working your abdominals, you are allowing your midsection to bear some of the weight and the pressure. Also, it helps provide support so that you always keep your balance and your body remains upright. “Why are abdominals important?” – now you know why. So start building those abs, not just to look good, but also to maximize motion and prevent injury. What new insights have you realized about your abdominals? Feel free to share them by entering your comments below.